Superficie 170m2 . 3 dormitorios, 2 baños. Planta principal : Sálon ( TV satélite and Wifi ), cocina completamente equipada ( lavavajillas etc..) terraza solárium y piscina privada. Patio : Habitación doble con cama canguro, cuarto de baño con ducha.Office con lavadora y secadora. Planta primera: Hall.Habitación con cama doble, vestidor y cuarto de baño con bañera. Planta segunda: Diafana , habitación doble con dos camas individuales.Terraza solárium con vistas. El agua caliente y la placa de cocina son eléctricas. La casa está situada en el Casco Historico de Vejer , a tan solo 10 min. de las playas de El Palmar y Conil.Un lugar privilegiado desde el que poder explorar Andalucia, sus amplias y vírgenes playas , ó ciudades como Tarifa, Jerez ,Cádiz y Sevilla. Los aeropuertos más cercanos son Jerez ( Ryanair, Airberlin ) and Gibraltar ( British Airways, Easyjet ) ambos a 1 hora de Vejer de la Frontera. Los aeropuertos de Málaga y Sevilla están a 2 horas, y en ellos operan multitud de compañías aéreas internacionales. Vejer es uno de los denominados Pueblos Blancos, situado en lo alto de una colina a 200mts sobre el nivel del mar , blancas ,estrechas y empinadas calles con los típicos patios andaluces y sus flores , sus murallas y monumentos históricos.Hay un enorme abanico de posibilidades a la hora de realizar actividades, un paseo por el bosque de La Breña ó una excursión al Parque Natural de Los Alcornocales. En la playa de El Palmar se puede se practicar surf , un paseo a caballo , yoga ó simplemente disfrutar leyendo un buen libro. También existen varios campos de golf en las inmediaciones. Cádiz la capital , con sus museos, galerías de arte y restos arqueológicos fenicios y romanos, sin olvidar la catedral y la Cámara Oscura. Jerez de la Frontera, cuna del sherry, obligada visita a alguna de sus bodegas, a tan solo 40 min. - Ground floor:living/dining room (satellite TV, CD), full equipped kitchen(dishwasher etc.) solarium and private swimming pool. Water system and cooker are electrical. •Patio:bedroom single bed and additional pull-out bed, bathroom with shower, and utility room (washing machine & tumble dryer). •First floor:bedroom with double bed, dressing room & bathroom. •Second floor:open plan bedroom with twin single beds and access to sun terrace with far reaching views. 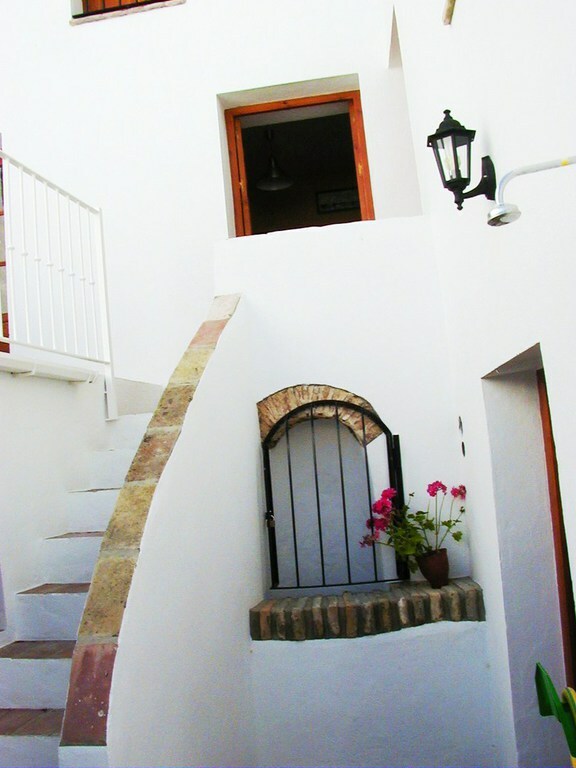 Less than 10 minutes drive from El Palmar and Conil beaches this house makes an ideal base to explore the Andalucian countryside , the wide and sandy beachs or towns and cities Tarifa, Jerez, Cadiz or Sevilla. The closest Airports are at Jerez (Ryanair from Stansted ) and Gibraltar (British Airways , Easyjet ..) these are both approximately 1 hour away from the house by car. Malaga and Seville airports are about 2 hours drive away, with many airline operators .Vejer, one of the “White Villages” sits proudly at 200m above sea level.This beautiful town with it´s narrow,winding streets has many delights to offer.Flower filled patios,turreted walls,and other historic monuments. Only 12k from beautiful,unspoiled beaches where you can windsurf, kitesurf,horse ride or just chill with a book. There are many places for a day´s walk in the forest of La Breña or a little further afield the Natural Park of Alcornocales.Cadiz, the capital of the region is home to museums,art galleries and roman sights,not forgetting the cathedral and the Camera Obscura. Jerez de La Frontera,the home of Sherry,where you can visit the bodegas,is only 40 minutes away by car. There are many golf courses in the area but if all this activity makes you tired then how about a yoga class on the beach?